When you are bound to your bed, there are not many things you could do. Most of the times you cannot even get out of bed to enjoy a lovely family dinner. You can read and watch TV, but that will bore you at some point, which is why you need some other things to keep you occupied. Whether your state is temporary or permanent, the fact that you cannot move will not let you enjoy a great deal of things, which is why you need to make your life as comfortable as possible. That is possible with a simple overbed table. An overbed table is a small table, usually with wheels, that will allow you to enjoy a few things that you cannot generally enjoy. Sure, you can use it for your meals, but that is just the basics. You can also do a lot of other stuff, like put a laptop comfortably on the overbed table instead of your legs. You could also enjoy a board game with someone you care about, or simply write if that is what you are into. After you are done, you can just push it away and take a nap. There are various models from which you can choose. However, the fact that there are so many may make you feel a little bit confused about which one to pick. That is why I made this article. Its purpose is to help you make a smart choice that will fit your needs. Adjustability – not all beds are created equal, and neither are the overbed tables. You need to make a choice according to your bed’s Luckily for you, there are plenty of adjustable models that have several height settings. That way you do not have to worry that the table will be too high or too low from the surface of your mattress. However, if you do choose to buy an overbed table that does not have adjustment settings, make sure to make the proper measurements before making a purchase. It will save you some trouble. If you are not capable of making the measurements yourself, ask for help from a loved one. Ease of use – if you do opt for an adjustable table, ensure that the mechanism is easy to use. You cannot move out of bed, so I doubt the fact that you can handle a difficult to use adjustment mechanism. Ease of cleaning – you may think that ease of cleaning is not an issue, but wait until you spill something on a hard to clean surface. I always thought that sleek surfaces are easier to clean than the ones with ‘’ As long as you can clean an overbed table with a wet wipe, you should be just fine. Weight limit – this is another aspect that many people do not think about. However, even if you do not plan to place bulky items on the overbed table, you should think about the weight limit. Keep in mind that overbed tables are not meant to provide support when you get up from the bed. As long as the weight limit is somewhere around 40 or 50 pounds, that should be more than enough. Tilting surface – this is not something that every person who is bound to bed needs. 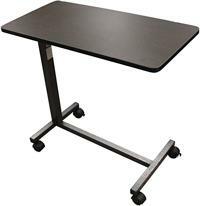 A tilting overbed table is very useful for individuals who have no mobility but need to work on a laptop. We all know that the position is more comfortable than a flat surface, which is why this feature comes in handy. Also, if you go for such a model, make sure that there is a side for the arm rest that stays flat. You can use a mouse or simply rest your arm. Take into account if you are left-handed or right-handed. High-quality wheels – that aspect is of particular importance because the wheels are usually the first thing to give in. That is especially if the surface beside the bed is carpeted or there is a rug. I say that from personal experience. Also, locking casters are a must. You do not need the table moving away at the smaller touch, do you? Additional features – overbed tables come with various features. However, some are useful while some or not. For example, some models come with drawers and pouches. While it looks lovely, the design is not particularly useful. In fact, there have been studies which show that ‘overbed tables are valued primarily for the top surface,’ and that people who use them rarely use other features. Nonetheless, if you think that the features mentioned above are useful for you, you can go for it. Just know that it will cost you something extra. What are you going to use the table for? – That is a valid question which many people ask. You need to keep particular circumstances in mind. For example, are you going to use the table for your bed and for your wheelchair (if you have one) as well? Construction – even though construction is at the bottom of the list, that does not mean it is not important. Look for an overbed table made of heavy-duty materials such as steel. Once you make an investment, make sure that you are not required to make that investment anytime soon. The higher the quality, the more you will be able to enjoy what you buy. But then again, that applies to all things, not only overbed tables. Finding the the best overbed table for you is not challenging. All you have to do is pay attention to some of the features it comes with. Take your time, look at the specifications, compare products, and then make a decision. An informed choice will always be the best thing you could do. After all, this is supposed to be an item that helps you get through the day. I know that it may seem too much pressure for a simple table, but think about the fact that you will be using this item every single day for a while. As long as you look at the things I mentioned above, you should be able to choose the right product for you. What is the best overbed table? Now that you know exactly what to look for, it is time to see what your options are. There are countless models out there, one better than the other. However, you cannot try them all. That is why I put together three of the best overbed tables I could find. They are not top of the line, but they are not bottom either. 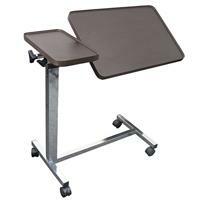 EVA Medical provides one of the best overbed tables on the market. It has several products of this sort, but this one is the first one that I saw and had an excellent price-quality ratio. It provides infinite positions that will allow you to use the table as you see fit in a comfortable manner. The adjustment mechanism is patented and based on a spring-loaded locking handle that lets you raise or lower the height of the table from 28 inches to 40 inches. The mechanism is very easy to use, and you do not even have to get out of bed to do it. This overbed table has a lovely finish. It has a walnut wood-grained laminate top with flush-mounted T-molded edge design. Not only that it looks terrific, but it is easy to clean as well. It has a sturdy heavy-gauge, chrome plated welded tubular steel construction on an H-style base with 2-inch swivel casters. That makes the overbed table highly stable, but maneuvering is a piece of cake as well. The wheels are reliable, and they are designed to handle all types of floor surfaces. In a few words, the overbed table from EVA Medical is very popular, and doctors recommend it for people who are bound to bed for various reasons. You will find it very useful, and you will be more than satisfied with your choice. The price is not high either. Click here to read more reviews and buy on Amazon. The first thing that seemed attractive about this table is the design. Let’s face it, overbed tables are not made to look lovely but to be useful for people who have issues with mobility. However, the simplicity of this table makes it very pleasant to look at. It has a sleek finish that makes it very easy to clean. The overbed table from Drive Medical is fully adjustable. It can be lowered to 28 inches and raised to 45 inches. Not to mention that the adjustment mechanism is very easy to use. There is a flap on a side that will make the entire process very easy for you. Assembly is easy as well. If you cannot do it, just ask for someone to do it for you. It will take just a few minutes. 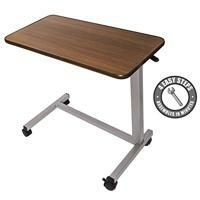 The base of the table is H-style with 2-inch swivel casters. The wheels are made of high-quality plastic that can handle all floor surfaces. The wheels can be locked into place for more stability, and moving the table around is simple. The table has a capacity of 40 pounds, which is more than enough for any user. You can use it for your laptop, eat, and for whatever else you may need. Once you are done with it, you can simply push it aside. Click here to read more reviews and buy on Amazon. I know that I have already described an EVA Medical overbed table, but this one comes with something extra. Just as the title suggests, this is a tiltable overbed table that is ideal for people who cannot get out of bed but still want to work on their laptop or use the table for reading. It is an excellent product that is worth its price. In fact, this is a two-part table. You can adjust one side where you can put your book or your laptop, and the smaller part can just lay flat for a mouse or even beverages. The table will tilt by using the control knob on the side. It has a straightforward mechanism and adjusting it is effortless. Apart from the tiltable feature, this overbed table also comes with height adjustability. The best part is that the adjustment is achieved by a slight upward pressure, which makes this table very simple to use. The top comes with infinite positions. You can set this table however you like in order to be comfortable. You can tilt it in either direction. The Deluxe model from EVA Medical comes with swivel casters for easy maneuverability and stability, and the powder coated, heavy-gauge steel construction makes it durable in time. If you do decide to purchase this item, you will be delighted with it. Click here to read more reviews and buy on Amazon. Click here to read more reviews and buy on Amazon. I cannot deny the fact that all three products are excellent. However, my personal recommendation is the EVA Medical Deluxe Tiltable Overbed Table. The fact that this overbed table is tiltable makes it more versatile than the other two products, and that is what you should look for the most in such a product. You will not be using the table for meals only, which is why versatility is important. That is the primary reason why I consider that this model is the best overbed table at a reasonable price.